Valium is a drug of the Benzodiazepine sedative class. Valium (diazepam) acts on the limbic, thalmic and hypothalmic regions of the central nervous system to potentiate the effects of inhibitory neurotransmitters. It possesses anxiolytic, anticonvulsant, sedative, skeletal muscle relaxant and amnestic properties. Valium is used to treat a wide range of conditions and is one of the most frequently prescribed benzodiazepines. Valium is considered addictive. The user builds a tolerance and feels the need to increase the amount they take to achieve the same "high". 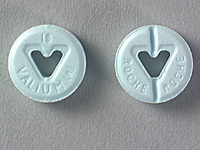 Over a period of time Valium becomes physically and psychologically addictive. Valium withdrawal symptoms are similar to those of other barbiturates and alcohol which included: convulsions, tremor, abdominal and muscle cramps, vomiting and sweating. Consequently, after extended abuse, abrupt discontinuation should generally be avoided and a gradual dosage tapering schedule followed. Although not usually fatal when taken alone, a Valium overdose is considered a medical emergency and generally requires the immediate attention of medical personnel. Overdoses of Valium with alcohol and/or other depressants may be fatal.